Here's a great pic of Batch 6. 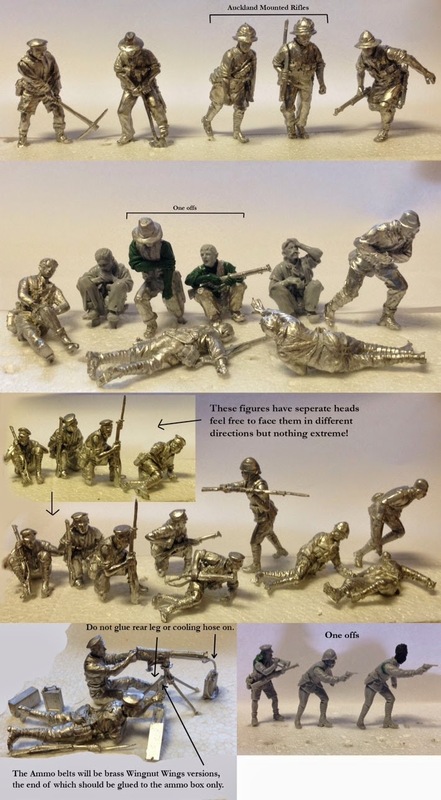 Armchair General sent these figures out on Friday, so coordinators of the painting groups will be getting them soon. Whoever gets the Maxim guns will need a brass ammo belt, which the Perrys have asked Peter Jackson if Wingnut Wings can supply. The Maxim gunners would need a brass rod inserted as well, so might need to go to an experienced modeller. There will be six more Maxims to follow. Armchair General has also had the first box from Batch 7 arrive. There is a second box that hasn't arrived yet, which he thinks is mainly casualties. He will be able to send out the final big lot early next week. We'll post a photo of Batch 7 then, too. By the way, we have included a label (in the sidebar on the right side of the blog) called 'Batch pics'. You can use this to look back on a particular batch picture for reference on how the figures are supposed to be assembled.